Use Our New Mobile App & Never Lose Track of Your Policy Information Again! As our life today becomes increasingly hectic, it is easy to lose track of those old-fashioned paper insurance policy cards. Here at Mackay Insurance, we are just as likely as you are to forget to place an updated insurance card in our vehicles or to replace last year’s now-outdated printed homeowner’s policy with the new updated document in our home filing system. Some time ago, we realized that what we needed—and what our clients need—is a way to carry our insurance policy information with us at all times! From that bright idea, the Mackay Insurance mobile app was born. From day one, we have worked hard to create an intuitive, fully functional mobile experience for iOS and Android devices where you can access all of your insurance policy information at all times and from one single portal. In this post, meet the new Mackay Insurance mobile app and discover how it can make your life both easier and more organized! In this short, focused introductory video, listen to our CEO, Bruce Mackay, review the new Mackay Insurance mobile app and its many features and benefits. What Can Our Mobile App Help You Do? There are times in life when you need to reach your insurance broker right away. Whether you have questions about coverage, you need to initiate a claim, you are ready to add to or edit an existing policy or you have had a life change requiring a new type of coverage, with the new mobile app you can reach out to your Mackay Insurance broker via phone, email, chat or website. With the new Mackay Insurance app installed on your phone, you can instantly access detailed information about each active insurance policy you carry. You can also print new insurance liability cards, review coverage limits and details, begin filing a claim, request new coverage or different coverage, update your personal contact information and much more. There are two easy ways to find, download and install the new Mackay Insurance mobile app. You can do a search for it on the app store for your smartphone. Our app is supported for both iOS and Android devices. You can visit our online client website and request your app login and password and a link to the new mobile app. You can reach out via email (app@mackayinsurance.com) to request your login and password and a link to the new mobile app. Once you have downloaded and installed the new Mackay Insurance mobile app, you have your entire insurance world at your fingertips! As you launch the app, you will notice there is a separate page for each of your active insurance policies (auto, homeowners, life, business, etc.). As you add a new policy, a page will automatically be created for that new policy. When you make changes to an existing policy, those changes will be reflected when you visit the app. 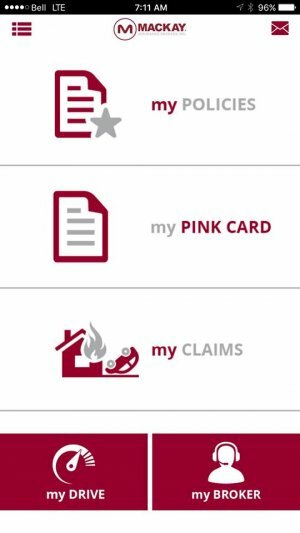 You can access and download or print out your policy information for all of your policies, including your official pink card, anytime you need them. If you need to add a new policy, add another individual to an existing policy, change your personal information, file a claim, view your premiums and payments or reach your broker here at Mackay Insurance, all of these other features are also readily available each time you power up the new mobile app. A tidbit of breaking news: We are so proud to announce that Mackay Insurance has been named Favourite Insurance Broker by Belleville’s The Intelligencer Readers’ Choice Awards! Mackay Insurance is a family-founded and -owned insurance brokerage. We have been serving the Quinte and surrounding areas for more than four decades, and we are so honoured to be recognized by our clients for our insurance services. Do You Need a Quote for a New Insurance Policy? Our online portal (and our new mobile app) make it easy to request a free quote for a new insurance policy. Download and install our new Mackay Insurance mobile app or visit our online free quote estimate generator webpage to request a quote for auto insurance, property insurance, life insurance, motorcycle insurance, commercial insurance and collector car insurance. Don’t see the insurance product you need on this list? Not to worry! Just reach out to us by phone, email or through our mobile app to request a quote for the insurance product you are seeking. Do you have questions about our new mobile app? Want to make a special request for new features you don’t see online yet? Do you need help locating or installing the Mackay Insurance app or navigating through all of its features? Our friendly, professional, knowledgeable team is happy to help! Contact us online or give us a call at 1-888-853-5552 to set up a time for a phone or in-person introduction to our new mobile app!